By 1912 plans were well advanced for the redevelopment of the Falls Hotel. Having secured the future of the Hotel on the site, the Railway Company now planned to expand the Hotel and erect permanent brick buildings. Preliminary drawings were supplied by Sir Charles Metcalfe but the final designs, dated April 1912, were executed in Bulawayo by the Railway Company’s chief architect Frank Scott. The new buildings were constructed from 1914, with completion of the work delayed several years by the impacts of the First World War. The final furnishing and fitting further delayed the opening of the new Hotel until mid-1917, at an approximate construction cost of £40,000. 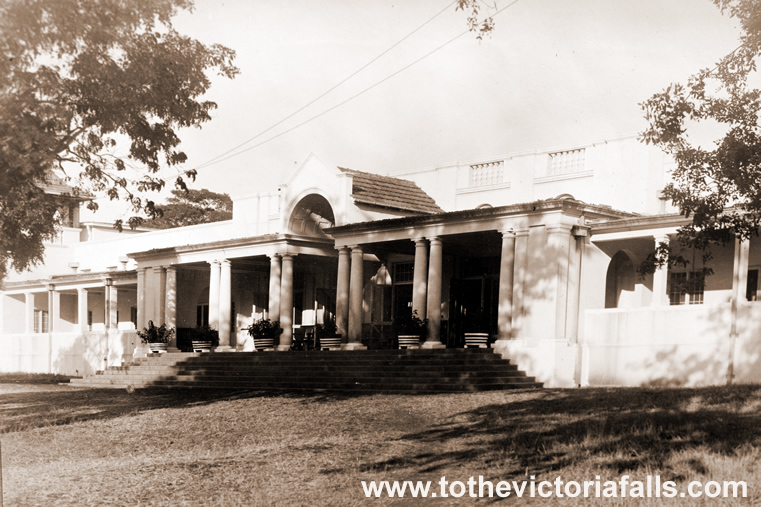 The cool and spacious single-storey building, consisting of a central wing and two flanking side wings, housed twenty-four bedrooms and two private suites. Two observation towers, either side of the main wing, gave panoramic views over the gorges to the Bridge and rising spray of the Falls. Guests could relax in the Lounge, find time for quiet reflection in the Writing Room, or socialise in the Drawing and Music Rooms, Smoking Room or small private bar. A darkroom was provided for the use of amateur photographers. The spacious new Dining Room was designed with echoes of features from the original railway shed which had served as the Hotel’s first dining room, an example being the high oval windows, also a feature of the Lounge. Another short wing housed the Hotel’s kitchens. The Hotel laundry was steam operated from the customised boiler of a Kitson-Meyers railway engine, decommissioned in 1912 after service at Wankie Colliery, and which remained on site and operational for over eighty years. 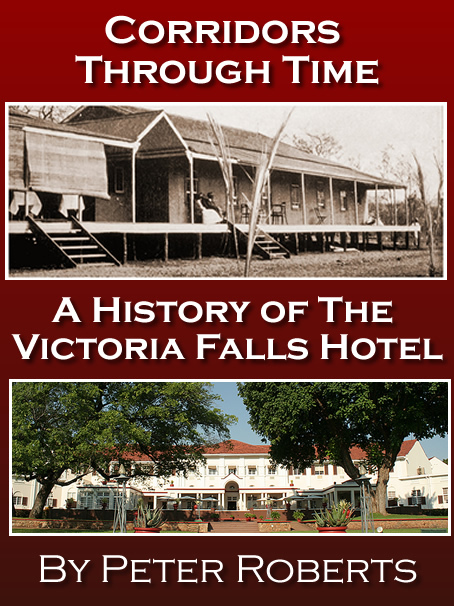 Efforts to encourage tourism included the running of two special trains, in 1926, carrying 350 American tourists from a world-cruise liner and including visits to Bulawayo and Victoria Falls, with the parties staying at the Victoria Falls Hotel for a couple of nights. The success of this tour, to be the forerunner of any more, led to the enlarging of the hotel in 1927. Another fifty bedrooms were built, with bathrooms and other facilities, were included in the new 'hammerhead' wings, along with modern rail station in a style to harmonise with the hotel. The growth of Percy Clark’s boating business on the river above the Falls had not gone unnoticed by the Falls Hotel. Recognising the potential profits if managed ‘in-house’ the General Manager of the Railway Company, Colonel Birney, made Clark an offer for his boats. The Falls Hotel purchased the launch boat ‘Diana,’ named after Colonel Birney’s daughter, and carrying up to 30 passengers. Two huts and a boat shelter were developed at the launch site, with boat trips operating upstream to Kandahar Island, where passengers would alight for a picnic, and the canoes downstream to Cataract Island, on the very lip of the Falls. In 1928 the Hotel invested in a second launch, the ‘Daphne,’ and soon after a third, the ‘Dorothy.’ The Hotel’s boat and canoe service was managed by Mr Victor Pare, who appears to have had more than the occasional close encounter on the river. 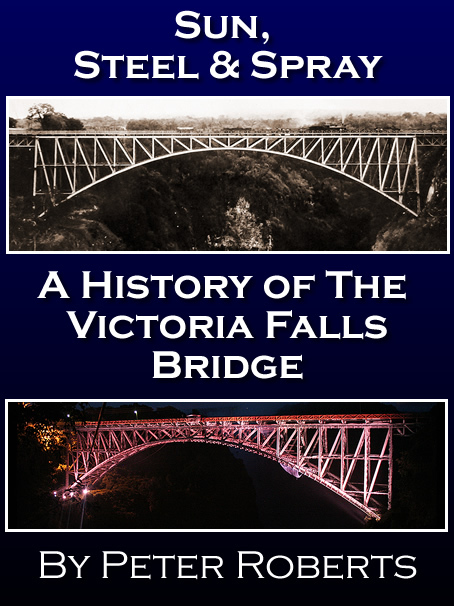 During the period of the First World War (1914-8) the Falls Bridge was a strategically important transport link for the movement of British South African and Rhodesian troops - and a potential target for German saboteurs, with German South West Africa (now Namibia) only 80 kilometres away. To prevent attack the Bridge was defended with a military guard, observation blockhouses and a rail mounted searchlight. After the war the fashion slowly returned for luxury cruise liner trips to distant destinations. 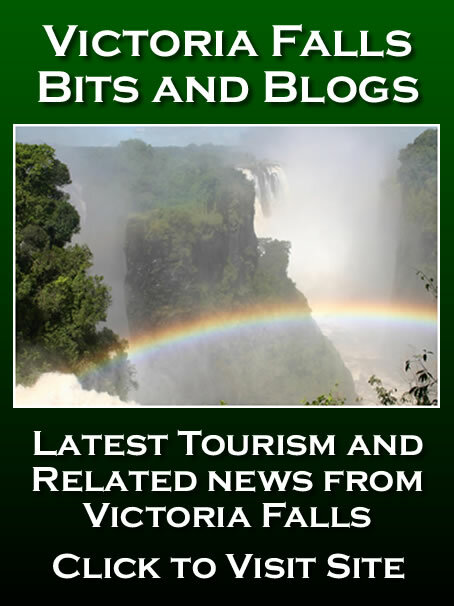 Union Castle reintroduced the ‘Round Africa’ cruise service in October 1919 and during the early 1920s visitors to the Victoria Falls numbered around three thousand per year. Many of the Union-Castle line’s vessels had been requisitioned by the British government for national service as troop or hospital ships during the War, and eight were sunk by mines or German U-boats. During the late 1920s and early ‘30s Union Castle dominated the route with a new generation of 20,000-ton steam liners, including the Carnarvon Castle, Winchester Castle and Warwick Castle, sailing weekly from Southampton to the Cape in only 14 days. In August 1923 a cenotaph was erected on the northern bank close to the Eastern Cataract, honouring the names of the men from Northern Rhodesia who lost their lives to the War. It was unveiled by His Royal Highness Prince Arthur of Connaught, grandson of Queen Victoria and Governor-General of the Union of South Africa (1920-4). After travelling by train to Bulawayo and then on to the Falls, Mackintosh compared the journey to her previous trek in 1903 and contrasted the many changes at the Falls since her earlier visit. The local rail trolley system was finally developed in 1920 by the Railway Company, at a cost of £4,000, and operated by the Hotel. 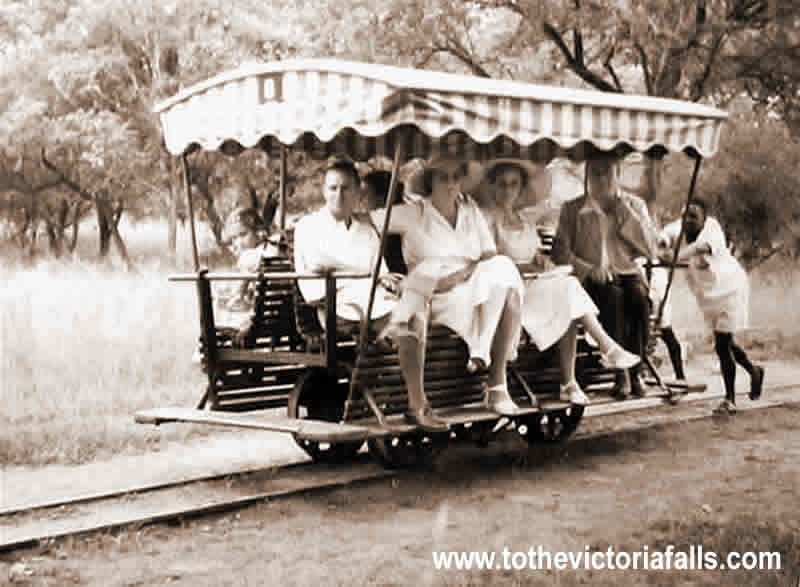 The hand-worked Victoria Falls rail trolley service which was in operation from the 1920s to 1957. Telephone boxes were installed at each terminus and junction so that a trolley could be summoned when required. The fare was one shilling each way. The trolleys were available during the hours of daylight only, although special arrangements could also be made with the Hotel Manager for night-time trips to see the lunar rainbow. One tourist however was not so pleased with his trip. George Graves, a famous London comedian of the time, on a visit to the Falls in 1923, was injured in an accident when his trolley de-railed, resulting in a claim for UKP2,000 being met. The trolley service continued until December 1957 when busses were introduced. One is preserved in the courtyard of the Victoria Falls Hotel, and another in the Bulawayo Railway Museum. 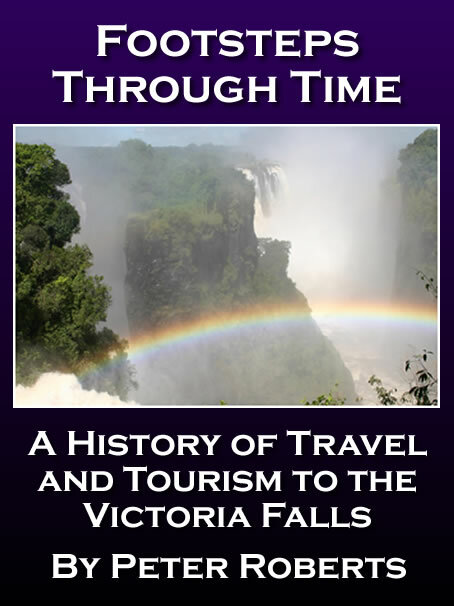 Roberts P (2016) Corridors Through Time - A history of the Victoria Falls Hotel. 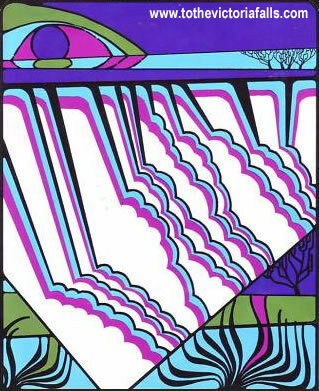 Zambezi Book Company.